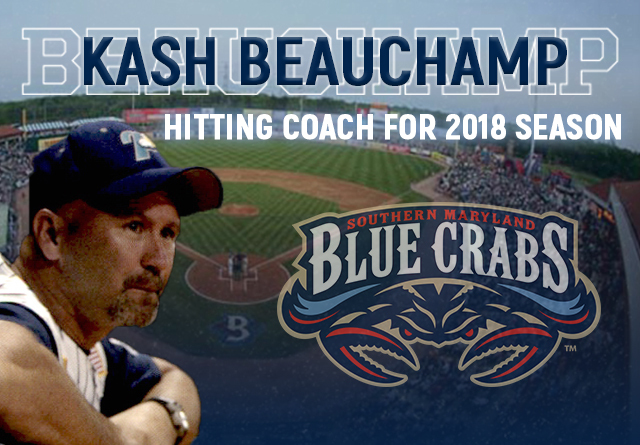 (Waldorf, Md., Dec. 20, 2017) - The Southern Maryland Blue Crabs announced today the hiring of 1993 Northern League MVP and Batting Title Winner Kash Beauchamp as the 2018 Hitting Coach. Beauchamp’s coaching experience includes a stint as a hitting coach in the Montreal Expos farm system, leading the New Jersey Jackals to a Northeast League Championship and managing the Lincoln Saltdogs, Adirondack Lumberjacks and Pensacola Pelicans. “I have known Kash for many years. He is simply an outstanding teacher of not only hitting, but baseball as a whole,” said Blue Crabs Manager James Frisbie. “He will bring an extreme amount of knowledge, passion, and intensity to our 2018 campaign. Kash is a tireless worker on the mental and physical side of the game. I can't express enough how blessed we are to have him join the Blue Crabs." Beauchamp was selected by the Toronto Blue Jays with the first overall pick in the 1982 amateur draft. He played in the minors for twelve seasons, reaching as high as AAA. His signing with the Cincinnati Reds after his MVP season in the Northern League made him the first position player signed out of independent baseball. Accolades during his playing days include the 1984 Carolina League All-Star Game MVP and being voted the Best Defensive Outfielder and Outfielder with the best arm in the Carolina League by Baseball America. He also was the first position player signed out of independent baseball. In his 35 years of professional baseball experience, Beauchamp has also held front office positions. He served as the scouting director of the Golden Baseball League and as the Vice President and Director of Baseball Operations for the South Coast League. The Blue Crabs play 140 regular season games in the Atlantic League of Professional Baseball Clubs. The Blue Crabs play at Regency Furniture Stadium in Waldorf, Maryland with affordable family fun. The franchise will begin its 11th season on April 27, 2018. Please call 301-638-9788 or visit http://www.somdbluecrabs.com for more information.